May is Celiac Awareness Month. I have been tested for Celiac a few times over the years though bloodwork and biopsies; and fortunately my tests have been negative. However, it has been suggested that I have Non-Celiac Wheat Sensitivity which means I experience symptoms similar to those of Celiac disease. I try to eliminate carbs in my diet, or find a gluten-free alternative, as I do feel better when I remove gluten from my diet. So here's one of my favorite recipes: Chicken and Waffles, Gluten-Free Style! 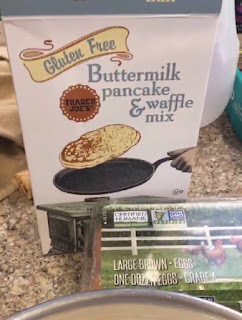 The best Gluten-Free Waffle Mix, in my opinion is the Trader Joe's brand! I've used it for a while now. 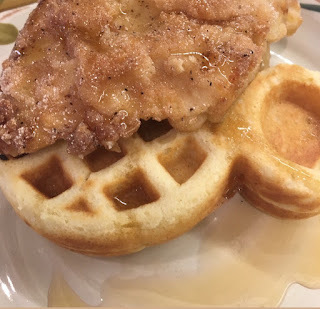 I follow the recipe on the box, but also add a teaspoon of vanilla extract for an extra touch of sweetness! As a side note, I tend to use organic, free-range eggs in my home. My family loves the taste of Pure Maple Syrup. 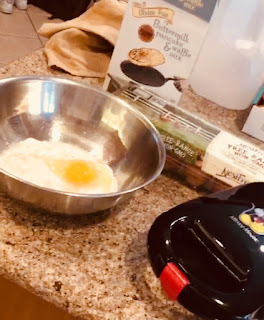 My husband and kids requested seconds! My drink of choice is Processco, but for those who prefer a non-alcoholic beverage, I suggest this nice sparkling tea that I found at World Market!